Food - We do not provide meals. You may use our kitchen for self service or hire a caterer to serve your group. We have more information on caterers and would be happy to give you some companies that we work with on a regular basis. Firewood - Venture provides one bundle of firewood per group. Additional firewood may be available from Venture. If not, firewood can be ordered from Phipps Ranch, 650 879-0787. A few simple guidelines help us keep our rates reasonable and the retreat center clean and in good condition. No pets. Wildlife is abundant at Venture Retreat. Bobcats, coyote, deer, raccoons and over 100 species of birds have all been observed within sight of the lodge. For the protection of both wildlife and your pets, as well as out of consideration for other guests, no pets are allowed at the center. Do not pick plants inside the pool fence. All plants inside the pool fence should be left intact for the enjoyment of others. Cleaning the kitchen (all dishes are cleaned and put back to their original places, remove all food from fridge, all counter tops and surfaces cleaned, sweep the floor, all appliances put back to their original homes). Groups will be charged for materials and staff time at the rate of $20 per hour for the time required to return the facility to the condition in which you found it with the exception of vacuuming the rugs and mopping the floors, which Venture staff is responsible for. Privacy is very important to all groups who come to Venture Retreat Center. To visit the Retreat Center, please contact us to make an appointment for a site visit. Pescadero, California is a charming tiny coastal town. It's the perfect place to unwind and connect with nature, and explore a few cute local shops and restaurants. Here are some links to local information and places to go while you are visiting Venture Retreat Center. This list is regularly updated, so please visit often...and if you have a link you would like to see added. Just next-door to Venture Retreat Center! The Butano Fire Road trailhead is just a 15 minute walk from Venture (at the turnout on Cloverdale road after Canyon Rd. ), or drive to the park main entrance in just 5 minutes. Park Map and Information. About fifteen minutes south of Venture Retreat, Año Nuevo has a beautiful beach and hiking, and is a breeding site and nursery for northern elephant seals and California sea lions. This historic family-owned Pescadero tavern has good food, a comfortable bar and a relaxed local atmosphere. Open for breakfast, lunch, and dinner. Grab a delicious cup of coffee and enjoy the eclectic assortment of vintage items for sale. This small town gas station also serves up delicious mexican food! Open for lunch and dinner, but if you're lucky you can order a breakfast burrito off the secret menu. This family owned bakery, deli, and grocery is known for their delicious artichoke bread. Don't miss out on the sweet treats, sandwiches, and house-made sauces, spreads, and dressings. Just 10 minutes from Venture, a comfortable coastal brewery serving lunch and dinner with an ocean view. Simple hostel with bunk beds under the picturesque Pigeon Point Lighthouse. This community website contains listings of local businesses, parks and community organizations. All About Retreats is a portal for the Retreat Center business. The founding Center of the "human potential movement" and currently hosting many Retreats, Workshops, Seminars and Internships. Venture Retreat is nestled in an area rich with history. Pescadero's heyday occurred over a century ago, when excellent trout fishing helped establish it as a booming seaside resort in the 1890s. • And the Duarte family tavern was destroyed by fire in the 1920s, but the original bar was saved. It can be seen in the modern-day Duarte's Tavern, still family-owned, generations later. A century ago, visitors who braved the grueling mountain stage crossing to Pescadero found vine-covered lodgings in Sarah Swanton's hotel and happy "gem" hunting at Pebble Beach. Today, after a more comfortable car crossing, visitors can still find quaint cottages along Pescadero's main streets and gems in the form of U-pick berries at Phipp's Ranch. Visitors can also see the oldest surviving Protestant church on the Peninsula. Built in 1867 in the classical revival style, the Pescadero Community Church was declared a state historical landmark in 1984. 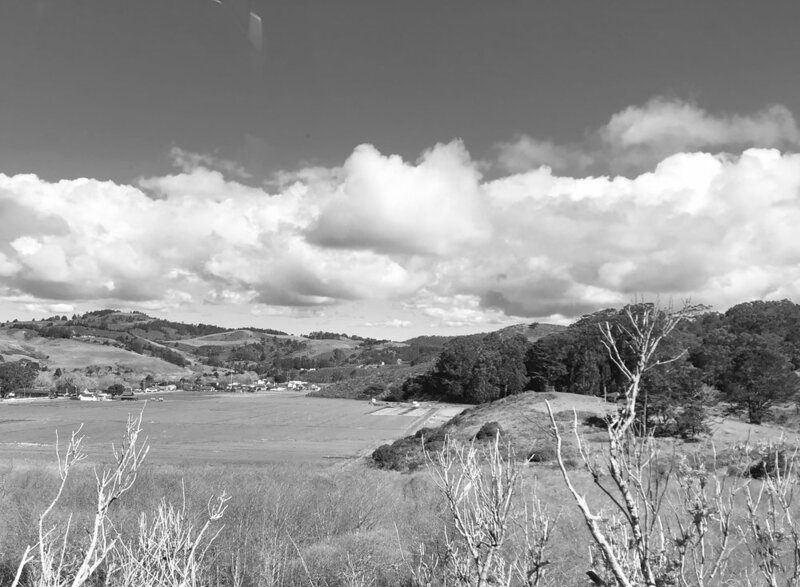 The area surrounding Pescadero has been preserved because of the hills, creeks and parks that separate it from the busy South Bay and San Francisco neighborhoods.